With all the advantages of living in Texas, including our affordable housing market, there are some drawbacks. One of which is the highly unstable soil due to gumbo clay and alternating drought/wet weather conditions. The frequent expansion and contraction of the soil is Texas home foundation’s worst nightmare. These unique soil conditions and weather patterns are a big reason that Houston homes have more foundation issues than pretty much anywhere else in the U.S. Most Houston home owners assume that foundation issues are a problem that is relegated to older homes, but in truth, any home can have a foundation problem, even a new home. So what’s a Houston homeowner supposed to do? Well, first you want to know what a foundation problem is, then you need to know what the signs are, how to identify a foundation issue, and when possible, how to prevent damage. This article will give you a primer on all this information. Okay, you probably aren’t a construction expert. Your skills lie elsewhere. And just as you know your car has an engine, so you should know that the foundation of your home is the cornerstone of the whole construction. It is the element upon which all else sits. In other words, the foundation carries the entire weight of your home. Obviously, this is a very important element to your home, so you really want to make sure it remains in excellent shape, and, when or if, something happens to the foundation, even something you might consider a minor issue, you want to get it fixed as soon as possible (not acting could result in much more expensive foundation repair costs down the road!) . When the soil under your house expands or contracts, is too dry or too wet, this can cause a problem with the foundation supports. It can cause the foundation to slide, the walls to buckle and in an extreme case, when these problems are left unattended, it can eventually cause the home to be unlivable, be condemned – and you lose all of the money you have invested in it. Got your attention now, huh? Yeah a foundation issue is a big deal. Don’t worry though, most foundation problems are fixable – providing you catch them in time. To help you a bit we’ve put together a list of things that could go wrong. Before we get into the list, we want to make it clear that these problems may be simple issues that are totally unrelated to your foundation. However, they are potential indicators that there are problems with your foundation. That’s why when you see these signs you should have them checked by a foundation repair Houston expert. How do you know if there is something wrong with your foundation? Well, if you walk through the house, out into the garage or even along your porch and you see a few little hairline cracks in the concrete foundation, these may not be as innocent as you think. 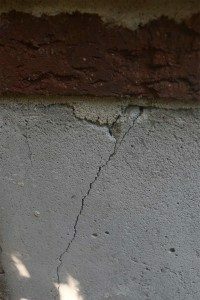 This is an important issue and you need to get these fixed, as small cracks can extend, grow and get even larger causing breaks and can even lead to serious and expensive foundation issues. Hmm. Your doors and windows start squeaking, they get stuck and even look a little lopsided. Nope, it’s not a paranormal event. It is something that could be occurring to your foundation though. Don’t ignore the problem; it could be something more serious than just expanding or contracting doors. Look for peeling or curling paper. Of course, this can be something else, but foundation movement or damage can also be the cause of this problem. When the walls, bricks or stones start cracking or breaking this is definitely a problem with the foundation. Cracks in the wall can be a real problem. Often these start at the door or in a corner and spread. Sure foundation repair is a scary experience, but if you catch it soon enough, the repair costs are minimized. Costs can run anywhere from a $2,000 to $30,000 depending on how severe the damage is. But beware, the longer you put the job off, the more expensive it will be to fix. What Does a Foundation Repair Expert Do? There are more than a few ways to repair a foundation and that’s why a contractor can’t really estimate a job without seeing what the damage is and what the foundation issue is. If the foundation issues result from bowing or buckling walls, the solution is to add counter pressure from the exterior or interior (depending on where the buckling is coming from). A foundation professional will add anchors to the opposite side of the buckling to straighten the wall back to its original state. As we said at the beginning of this article, the soil in Houston is very unstable and our alternating severe hot and cold weather causes the soil to expand and contract which causes the foundation to shift. In these cases, an expert may suggest a pier stabilization system to better support the foundation at a lower soil level (one that is more stable). When areas like crawl spaces seem to be sinking, this is caused by a poor support system, then the foundation service expert may suggest using jacks to offer more support. Is there anything I can do to prevent foundation problems from happening? Sure, just as with other areas of your home, prevention is key to keeping the foundation in good shape. By keeping the foundation soil stable and moist (not wet) at all times you can prevent that contraction and expansion that is so damaging. Periodic inspections to look for cracks and even a yearly visit from your plumber can help. Keeping your landscaped areas synced with your drainage system can also help. When you live in an area like Houston that’s prone to cooler weather in the winter and droughts in the summer, you need to keep that soil from expanding and contracting so much. You can do this by keeping the soil next to the foundation moist. Use a hose to water this perimeter in the mornings and evenings. However, this constant watering is a bit of work, so you may want to get a soaker hose you can leave on for about 20 minutes in the morning and evening. Check and clean drains and gutters. Keep downspout areas free of debris. You want drains clear at all times. This will keep direct water away from the foundation. Check the soil your home sits on, if it’s sandy make sure drains are kept at least 5 feet from the foundation. If the soil is expansive, move the drains out at least 10 feet from the foundation. Notice where water tends to puddle during the rainy season. Check to see if there are water puddles near the foundation. Find a solution that will drain this water away. Remember, you want the soil moist but not wet. Install ground drains and a catch basin to drain the water off. Make sure your home has a proper grade so that water drains away from the house and the foundation. This should have about a 3% to 5% slope. If you live in an area that is prone to erosion, keep control of it by using proper landscaping techniques. Use proper ground cover, rocks, gravel, grass, concrete liners and even retainer walls if necessary. You should certainly have the plumbing system checked every year. Unfortunately, your pipes are not out in clear sight. It is easy for a hidden pipe to have a leak and that water could be draining into the foundation without your knowing it. That’s why you want a plumbing professional to come in and check the system out every year. Aren’t Some of These Prevention Methods Expensive? Yes, adding special retaining walls or landscaping to prevent drainage around your foundation can cost some money, but these are expenses that are a lot less than what it would cost to repair your foundation. Besides, these are projects that can add value to your home, and best of all, you can do many of them yourself. A foundation repair job can never be a do it yourself job. Foundations are just that, the basic building structure on which your home sits. So damage to the foundation can cause damage to every other aspect of the home. This is not a problem that you want to ignore. You really want to pay attention to this area of your home, even if you don’t attend any other area of your home. Foundation work can be unexpected and it can be an expensive repair, but you can prevent it or at the very least, minimize the damage when you care for the foundation on a regular basis. Truth is, a little TLC goes a long way, so care for your foundation as much as you do for your yard or garden. Even with the information provided above, you really can’t tell how serious your foundation problem actually is. That’s why it’s a good idea to take advantage of our FREE, no obligation inspection and estimate (if repairs are needed) from the best foundation repair Houston pros around. Schedule yours today by calling us or filling out the form.